Environmental Noise Control performed a computer noise study and model on a compressor station in Colorado, USA. ENC established that the compressor station was not in compliance with the Federal Energy Regulatory Commission’s (FERC) noise limits. ENC designed and installed noise mitigation which ensured that the compressor station be in compliance with FERC limits. Custom silencer banks and ENC’s industrial permanent acoustic walls were utilized on this project. Environmental Noise Control was commissioned to provide a noise study for an Antero Resources Corporation compressor station in Colorado, USA. 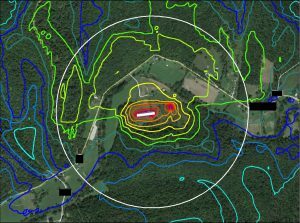 The assessment used acoustic computer modeling to determine noise compliance within the Federal Energy Regulatory Commission (FERC) limits. The compressor station consisted of a number of compressors and vertical coolers housed in a compressor building. ENC’s acoustic computer noise modeling showed that the compressor building would require noise mitigation to reduce noise levels to those within FERC regulations. Using the computer noise model and report, ENC was able to design a complete noise mitigation plan that ensured FERC noise requirement compliance, saving time and costs associated with installing “off the shelf” materials that may not have had as great an effect on the compressor noise. 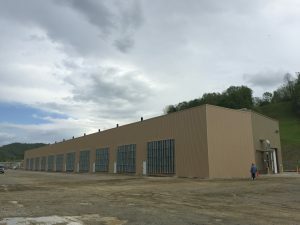 The mitigation modeled and then implemented on the compressor station included ENC silencer banks on the cooling towers as well as ENC’s permanent industrial acoustical walls. ENC’s industrial permanent structure enclosing the compressor station and ensuring noise compliance with FERC. Noise modeling shows this compressor station is in compliance with FERC. *Representation only, not for reproduction. Fill out and submit the form below and one of our representatives will get in touch with you to discuss how we can help you address your noise mitigation needs.